Sun. Summer. Heat. Sweat. Humidity. A clear sky. The rainy season accompanied by the wet monsoon. A paved road. It has cracks. You can see the grass struggling to grow between them. Grass is green. Or blue, perhaps? I don’t know. I don’t want to know. Why I don’t want to know? Good question. To answer a question I picture an image in my head. Images. Images of someone. All I know is that is a girl, but I can’t tell the color of her eyes, or hair. How old she is. What she is wearing. If she is tall, or short. If she is pretty, or if she is not. Does it matter? Do details even matter? No. Or so I think. I want to think so. I want to believe so. I say I want, I want, I want. But why instead of “I want,” I say “I will”? Even if I won’t, at least sounds more resolute. Total silence might be the best, instead of words. Words are tricky. People play with words, or rather words play with people. And yet we love them. Or so… I think. I think, but never do. I’m just thinking of images. Images of this summer. Of this girl. This paved road is hot. This cement is burning. I’m thirsty. But mere water won’t be enough. This is not that kind of thirst. There must be something else that appeases this thirst. This craving of mine. I yank off some grass from the ground and put it in my mouth. I start chewing on it. It’s a dry, unpleasant taste. But it makes me forget about this thirst even for a little while. So, I start walking on this road. No direction in specific. Forward. Always forward. I get bored soon enough. But this girl comes to my mind once again; who is she? Is she causing this thirst I’m suffering? Probably. Probably not. I want to be with her, that much is certain. It’s obvious. But God doesn’t seem to agree with it. Why am I mentioning God? Well, that’s another good question. Hi. I’m here once again to talk about the past two games I read, with yet another introduction comprising tiny pieces of intermittent themes (derangements) that went through my head as I was reading. As I mentioned on twitter, I’ll cover two titles on this post. One by Hiei, and other by Takehaya. As per usual, this isn’t a spoiler-free post so proceed with caution. Let’s get going. RUN is a relatively obscure game by Hiei Murasaki, nowadays known for being the writer of the popular Baldr series, mostly. I came across this game surfing the internet, and also due to Baldr Heart’s forthcoming release at some point along (I hope) this year, so I decided to see for myself another side of Hiei, so to speak. A more personal, albeit not exactly compelling one. Anyway, I’m afraid to say the result was somewhat disappointing, and though I’m grateful he tried to explore new themes and ideas to the ones we’re accustomed by him, to be honest, the final product fell flat. It didn’t quite deliver as I expected it to (though that may be my fault). I usually try to assess games from a more technical, practical aspect first; how they want to make feel the player, what they want to accomplish, and how they will accomplish that. The -feels department- comes second. For now, I’ll move onto the plot, and fill you all in. The story begins with Kouichi, the only son from a wealthy family. His mother died when was very little, and within that lapse of time, his father married a second time, and the stepmother brought her own daughter over, Serino, who would later become Kouichi’s little sister. His father used to ride a bike in his youth, on which he went on many trips to many places, meeting up with new people, and having different experiences. Kouichi liked to listen attentively to his father stories, no matter how plain, or simple they sounded. Both his admiration and love for his father grew with the pass of time, mostly due to these stories, and seeing how other people relied so much on his father. But after a couple of years, his father passed away. It’s normal, life comes to an end, he thought. By then he was already a college student, and would soon inherit and administrate his father’s company. Reality kicks in, a reality far away from those stories he used to hear. He had to embrace it, until he stumbled upon that old bike once again. It was non-functional, rusty, long forgotten by time. That beaten up bike, left abandoned at the corner of the garage brought him to tears the moment he laid eyes on it, and decided to do a total restoration of it to go on a journey, just like his father did. Easier said than done, though. There’s school, responsibilities, and pretty soon, work. Somehow, he got permission, both from his father’s company and school to be absent for a while. And his stepmother helped him with the cost of the bike’s restoration. Okay, everything is moving smoothly. But he hasn’t done anything on his own, he is just the family’s pampered child. They answer to his whims. But that’s precisely why he wanted to go out to the world; to grow as a person, to gain experience in life, to stop being the family’s child, and become like his father, his life-long role model. To obtain that “something” his father had, but he actually hasn’t. From this point onward you can get the picture of what kind of protagonist this guy is. Hiei’s text is actually comfortable to read, simple and effective, but when you don’t even know where the game is heading, then there’s not much to do. The story started solid, but became more and more dull as I advanced through the game. Some passages had a good flavor to them, actually making me think that “something” could actually happen, but never did. After finally starting his so-desired journey, all of sudden a girl appeared in the middle of the highway from some bushes as Kouichi was driving at full speed. Long story short; he almost got killed, and almost killed the girl, too. They introduce to each other after the incident, and this one event sets off the duo’s relationship. 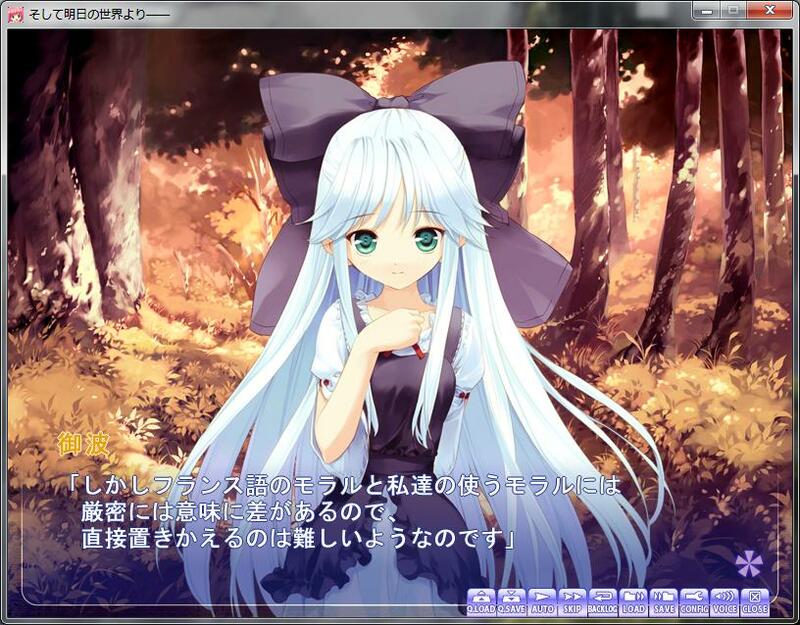 However, this girl says she doesn’t remember her name, so the protagonist names her Nana for the time being. She serves as the main heroine, and definitely is the strongest of them all, which doesn’t mean she is any memorable, sadly. She asks Kouichi if she can accompany him on his journey, without mentioning the motive for it, or giving any details. Guy falls over for the girl’s apparent beauty, and agrees. Unfortunately, the game follows a linear story, one you can’t avoid. You start your journey along with your new partner, and travel from town to town, where you stay for a while, while your look for a job and try to get by. After you’ve saved up enough for daily, travel expenses, then you travel to the next town, and so on. However, you encounter with a new heroine in each town, and start developing a relationship with her, while at the same time, you keep living with Nana in said town. The choice is yours, you either stay in that place, and form a relationship with the new heroine, or continue your journey with Nana. Nana is supposedly trying to find that “何か” just like you, which is shrouded in mystery about his real identity, since she seems to suffer from amnesia, and also possess an archaic accent pretty reminiscent of the Edo period. Back to the gist of things, though, this conflict about what to do (stay or continue) is just settled with some petty drama, and that’s pretty much it. You discover, so to speak, new places and heroines as you advance through the game and unveil bits from Nana’s true background, which I will reveal because I’m terrible. She’s actually a girl (Well, the soul of a girl) from the Edo period who possessed a girl from certain Shrine. The girl from the shrine is named Mana, and has a different personality and accent to that of Nana’s. They switched personalities due to an earthquake that took place near the shrine after Mana lost consciousness, but that’s pretty much the only details that are given. As I already mentioned, the rest of the heroines are not exactly characters to remember, except maybe Himiko, who is second to Nana in the ranking. There’s five routes, of which only three can truly be called so, since both the childhood and imouto routes were pretty watered down. They made it pretty clear to me Hiei wasn’t in the charge of the planning, let alone the direction. Now, one of the very few aspects I did like is the protagonist actually displaying signs of growth during the journey. He realizes the motive for it is childish, and starts looking for one midway through, one of his own, which is being relied upon by others. He ponders about the idea of what becoming a full-blown adult implies, and the hardships that come with it, which are inevitable. What going out to the world means, finding one’s true identity in life, and living according to one’s standards. While it may be cliché, it remains as one of the very few good bits of the game overall. I don’t tend to give out scores for the games I play, but this is one exceptional case, so I might start doing it in the posts to come. 6.2 out of 10. I wish I could recommend it, but I’m afraid I can’t do so, except if you’re some die-hard Hiei fan and want to see more of his work that isn’t Baldr. I should also add this was commissioned work, so the result was to be expected, I guess. It wasn’t a total waste of time, but I can’t say it satisfied me either, so it’s a pretty strange game to say the least. Despite clearly stating its ideas and what the protagonist sets out to do, there’s no actual backbone to support said ideas, nor a really engrossing story. I guess I prefer the Hiei talking about more complex topics and mechas. All right, time to switch gears and move onto this post’s main dish. Takehaya is one writer that got involved in a strange chain of events. More than ten years ago he aspired to be an author to be remembered among the greatest, but now he lies at the shadow of what he could have become. Recently I had the opportunity to read some volumes of his LN series, Rokujouma no Shinryakusha. Veredict: It’s neither bad nor boring, as the text is not barren or anything, and the story is interesting enough to go on for a couple of volumes, but I could tell it’s really forced, stiff, as if he didn’t want to talk about that: a romcom. I could recommend it if you haven’t read anything by him. I was at the fourth volume and I could clearly see it wasn’t the text with the same consistency, nor daintiness Konakana was injected with, and I still need to get to Kanishino to see him at his peak, so the gap among his works, and their respective substance, is something to behold. Hayakari is probably one writer I could compare him with, as they couldn’t really seem to be able to maintain a standard within their works, but Hayakari’s story wasn’t a bit as sad as his. Anyway, I read Asuseka right after RUN this time around, which marks the end of an era for Takehaya, and his last ambitious game. Well, I was surprised and must take my hat off to him this time. From the story, characters, BGM, CGs coloring, the way he approached text, to the smooth transitions that took place within some scenes and how they merged with the general atmosphere, as if there wasn’t a cut, everything was spot-on. The game was directed in a pretty masterly way, to the point that some parts almost seemed like film shots, and there’s this softness (?) ever present within the mood. So, yeah, that’s to say I felt comfortable with pretty much everything, except with some minors details in the routes, but that’s another story that I’ll talk about later on. If there is one thing I appreciate when reading is the level of immersion the text, or atmosphere offers, and Asuseka did a good job on that front. I didn’t have a problem to dive head first into the core of everything, and seeing how things escalated as days passed by. With that said, I’ll proceed to explain the story as detailed as possible. There’s no turning back now. An isolated island. A big family, even if most of them are not related by consanguinity. A promise. The sunset. Salty breeze swiftly, but also gently wafting on the air. A vast, azure ocean divided by a seemingly endless sky. A charm ever present around the inhabitants of the island, never ceasing to soothe you. A peace of mind beyond imagination. That’s what waking up is like in that island. At least for Subaru Ashiya, this story’s protagonist. Perhaps for the rest at the island too. Everyone leads a peaceful life in this remote place, far away from the everything. Subaru walks to school every morning with Hinata sisters, Yuuhi and Asahi; they’ve been together their whole life. It’s a routine, but there’s something concealed within it, something that makes it feel as new every day. The sun shines upon them as they climb their way up to school, where their friend Aoba awaits for them. Aoba, always in high spirits and jumpy. Her beautiful long hair, black like the night, swaying as the wind blows through. Then up ahead, there is Minami, who just moved onto the island. She’s a girl with refinement and grace in her way of talking, speaking, behaving; she’s just one of them now. A member of this place. After a while all arrive at school, where the student rate is kept at the bare minimum. It’s almost as if everyone were together the whole time, like a family. Family. A bond. A family that awaits for you at home, just to ask you about your day, talk with you, listen to you. A mother whom you can rely on, that feeds you, and worries about you. Ah, that woman. Subaru’s mother, Umi. Just a little later, his father, Ryuu, arrives from work, and sits on the table to have dinner with them. This moment. This tiny, microscopic moment; I wish I could encapsulate it, and keep it forever, he thinks. This warmth, this cosiness. There isn’t much variation with the food; it’s probably the same as always with different spices, since Mom is not exactly good for cooking, but the sensation is different. It’s not the food, but the people you eat it with. I know this may seem like an just another trifling moment, and it probably is, but it’s of tiny fragments like this that the puzzle is completed, and when that happens, the happiness I’m assaulted by is so vast and wide I just can’t contain it. I share it with my family, with Yuuhi, Asahi, their father, my parents, Aoba, Minami, and of course, how could I forget, Yashima, everyone’s “grandpa,” even if he isn’t related by blood to any of us. Like I said, we’re all a big family on this island. Our tiny, remote, solitary island. There is something to it more than meets the eye, it’s something I can’t word precisely, but its beauty and warmth wraps around me and everyone. Yes, I like this island. No, I love this island. But people, however, keep abandoning it. And that’s something I just can’t do, for I made a promise. A promise with Yuuhi and Asahi’s now deceased mother to always protect them, and make them happy. I know it sounds too stereotypic, but hey, I was just a kid back then. Now people head to mainland to start a new life, and I just don’t get it. The island’s population decreases, and I don’t know how to feel about it as I gaze up at this sky. Yuuhi once asked me: “Why do people keep abandoning the island?” To which I answered: “Probably they get tired of it since it never happens anything.” And she replied: “But that’s a good thing, isn’t it? It’s peaceful.” And indeed, you are right Yuuhi, this island is not the problem, but the people. It’s better this way anyway. I firmly clinged onto my beliefs and continued my life with everyone at the island. Helping my grandpa digging up to set up a onsen atop of the mountain, helping Asahi and Yuuhi with their store, which is always entertaining in and of itself. Spending time with everyone at school, running at the track-field with Aoba and Yuuhi until we’re out of breath, and then lying on the grass to contemplate, once again, this sky that seems to take us deep into it. And then I come back home, to my parents. Have dinner, take a bath, and spend some time playing around with Yuuhi until she falls asleep. Late at night, I look up to the starry sky through the window, hoping these days never come to an end. However, the world is ruthless. The world won’t allow that, as everything was about to come to an end, and in the worst way possible. It’s as if the world itself was trying to teach us a lesson, to tell us we’re weak, small, insignificant. And it might not be wrong, for what it was about begin… was the end of it all. Despair. Fear. Angst. Death. A pouring of emotions. It was just too sudden. How to believe something like that. How to believe that everything you’ve loved, everything you’ve clinged onto, all the people you’ve cherished, the little details about the little world we live in, anything you’ve cared for was about to vanish, without leaving any vestiges behind. From that distant sky I used to gaze upon every night, our demise was approaching with each passing day. I just didn’t know how to react. My world turned upside down. The more we were close to the end, the more our world fell prey to depravity. Mass suicides. Robberies. Chaos. We could do nothing but watch. In less than a day, everything changed. But we were safe at the island at the very least, our lives kept their normal course, our everyday as usual… But I couldn’t been more wrong. All right, sorry for switching between first and third person while narrating, but I deemed it necessary to try to evoke what the protagonist was feeling, thinking about, experiencing, or at least part of it. He’s actually a likeable guy, and getting to see how he suffers a transformation due to the announcement was interesting, though, certain bits of the game might make you rise an eyebrow about the standing he takes, or how he behaves. In fact, most of the characters (Yuuhi is the exception) presented a change after knowing the news, but how abrupt the change was is what impressed me the most. Game’s story is spanned over the course of a two-week period, and first four days of the game are filled with slice-of-life scenes, humor and various scenes with Subaru narrating how he feels about the island and everyone in it. How deep can the connection of a human being get to be with something so precious and valuable that is probably impossible to explain it to others, since only that person knows how it actually feels. After those four days, the announcement about the meteor is made public, and hell’s break loose throughout the world. The game’s atmosphere took a 180 degrees turn, and became a little heavier to swallow, as some characters (especially Aoba) took a pessimistic view of things, Subaru included. I’ve got to thank, however, to his grandpa for great pieces of advice, otherwise the protagonist would’ve gone mad, no joke. His VA was also excellent, and is actually an old pops; pretty cool. The promise I mentioned earlier was between Yuuhi and Asahi’s mother and Subaru eight years prior to the game’s events. Quite literally, she’s making Subaru promise that he’ll marry both of her daughters, something Subaru fiercely rejected. In between those eight years, Aoba tagged along, and just before the announcement Minami moved into the island, and that’s how the family is formed, so to speak. After her mother died, Yuuhi developed the habit of clinging onto Subaru the whole time, as though he was his father, and Asahi the mother. This peculiar way of treating each other doesn’t rub Subaru in a wrong way, but makes him question it nonetheless. Yuuhi lost her mother, and while she did have a fatherly figure, she put Subaru over her own father, not because she didn’t love him, but because he was always busy and she didn’t develop as much familiarity with him. Asahi blames herself for this, as she was involved in their mother’s death, and as a way to make up for it, she gave up on her dreams (Opera singer, Music teacher) and decided to become the backbone of the Hinata household, no matter what. While she was off the island studying at college, Subaru was in charge of looking after Yuuhi, keeping the promise he did to their mother. Aoba’s story, for one, is more about the rancor she harbors towards her mother, as she abandoned both her and her father when she was little. This deeply affected her personality, having inner battles to show her true inner self (to not become like her mother), and going into fits of rage to obtain Subaru’s approval as a girl, either by using make-up, acting less tomboyish, or wearing dresses, but all this in a pretty servile manner. That, however, is nothing but a cover to conceal her true self, one Subaru ignored for years; goes without saying she suffers from a severe lack of self-esteem. I couldn’t help but feel pity for her, and irritation for that donkan of a protagonist. 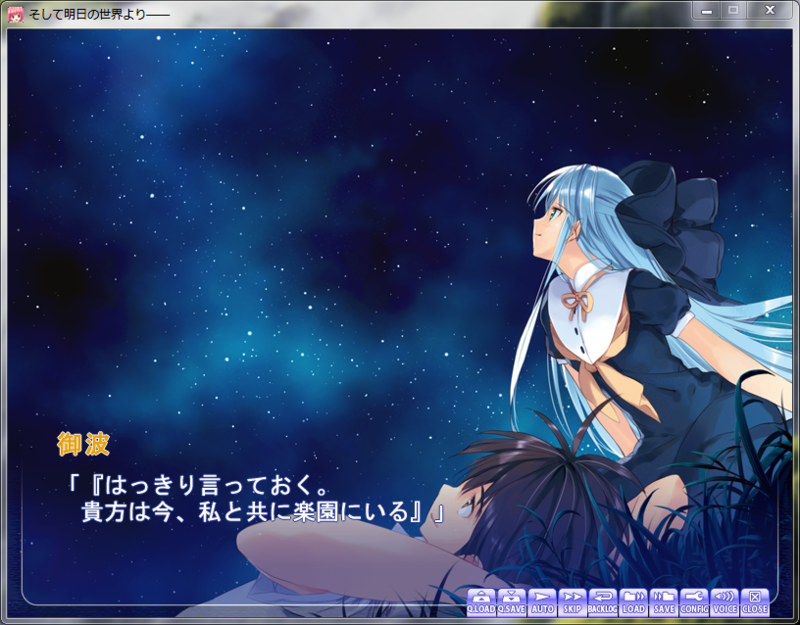 On the other hand, Minami’s route was so warm, and the concept is based on is so simple (what is friendship? ), yet Takehaya took that and delivered something beautiful and meaningful. A girl that can’t go out, can’t eat almost anything, and can’t do anything except reading books all by herself. “Who would want to be friend of someone like that?” she said. But she was wrong, as she realized it the moment she moved onto the island. I actually had to take a pause midway through it as my feels-o-meter was reaching dangerous levels, and was my favorite route out of the four. Hearing her out was really interesting (1, 2, 3, 4). Yuuhi and Asahi’s routes were deeply interconnected so, as a whole, they were more like one big route with different conclusions each, and Yuuhi’s ending in particular was great; Takehaya showcased nods towards Christianity throughout it, I might add. Since all characters are pretty much together the whole time, you don’t really feel far away from any, or like you’ve entered a new route until you start spending more time alone with any of the heroines. There’s five routes in total and one after-route. The fifth is a general route where you don’t wind up with anyone, and leads up to a satisfying conclusion, which is seen with more detail in after. Heroines routes unveil pieces of their backgrounds, and those pieces are put together to add up to the core story, which is concluded in after route. All routes have their shining moments, but this one definitely took home the prize. 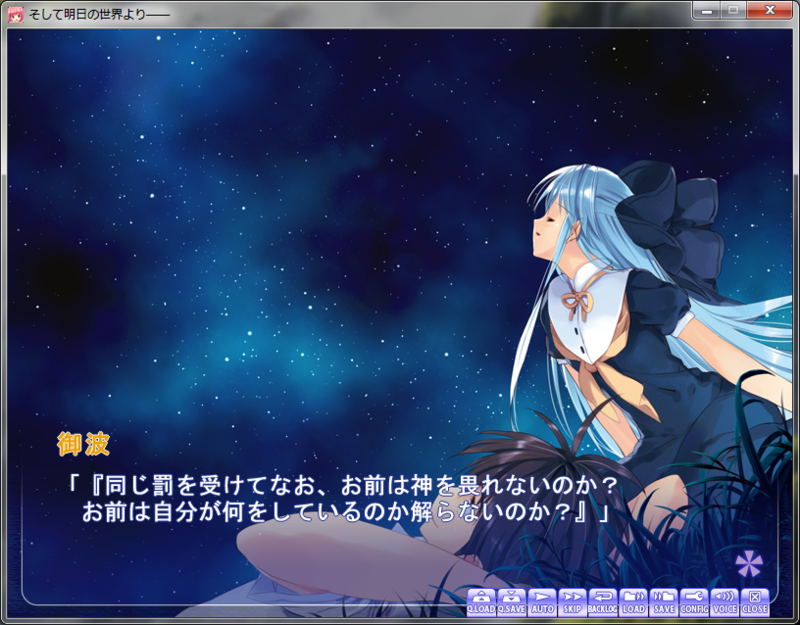 It’s what I’d call the soul of the story, and is worth reading all five routes just to arrive to it, really. Asuseka started as a slice-of-life, but suddenly became a tour de force about the struggles of human spirit, to find enchantment in the simplest of things, and make the most of the time you have with people you care about. To tell you life is more than birth and death; to tell you we’re all blessed. Why? Because we’re all alive. People cannot be completely alone, and while some people do say they can, they’re probably lying. People need of other people to live. Deep inside, people are afraid to be alone, to die alone, without being remembered. To not be heard. But fortunately, no one in this world is completely alone. No one. There will be moments where you actually feel like your world is over, that is breaking apart, but I assure you there will be someone to give you a hand, or at least hear you out. You’re right. The world is ruthless, and will try to bring you down. Will you stay there, down? There lies the question. Would you be able to endure it if you were completely alone? Another good question, and frankly, there may be no answer for them. But it’s okay. It’s probably better that way. The world truly comes to an end when you give up on it, so don’t. Cry if you need to; hide under the sheets, and bury your head in the pillow until you fall asleep. Sleep your anxiety away if necessary. But don’t give up, for it is only over when you do so. The world is here. You’re not alone. And with this one chapter closes, and another opens. A post with many questions, but unfortunately, not many answers. Such is life. It probably took me more time to think about a proper rating than to write this post, but here it is. 7.8 out of 10. It didn’t really tell me something I didn’t know already, but it definitely reminded me about some things I usually take for granted; things that are essential and within reach, but fail to see, and don’t appreciate as much as I should. I want to believe it’s never too late.